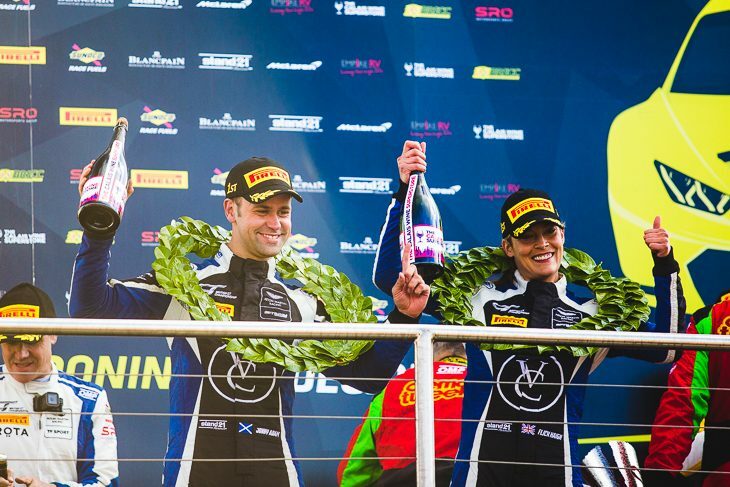 The 2018 British GT GT3 driver’s title was never really in doubt as Flick Haigh held her nerve and kept the car in the top five for most of her stint. This was a stance which Jonny Adam mirrored when he took over the #75 Optimum Aston Martin, leaving Phil Keen, Nicki Thiim and Yelmer Buurman to run on ahead. TF Sport’s Thiim bagged the fastest lap of the race with a 1:28.196 as he tracked Keen’s Barwell Lamborghini down throughout his stint, perhaps a little keenly given the subsequent track-limits penalty, and he took the lead out of Redgate. Despite Keen very opportunistically re-taking the lead on the penultimate lap, Thiim fought straight back to pass the chequered flag first in the #11 TF Sport Aston Martin. A 30-second penalty was added to #11 for track-limits infringements, however, meaning the #33 Lamborghini (below) was declared the winner, ahead of #11 and the #116 Mercedes. 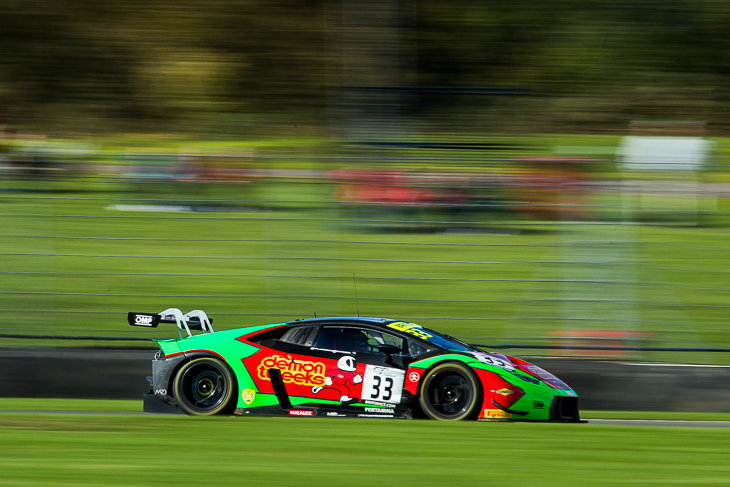 The #33’s starting driver Jon Minshaw had built up a lead approaching 20 seconds within the first 25 minutes of the race, but a safety-car period brought about due to oil on the track at the end of the Wheatcroft Straight took some of that away. Having his team-mate Sam de Haan in second (and five lapped GT4 cars in-between) clearly helped limit the losses, but the #11’s opening driver Mark Farmer battled his way past Haigh and then, at Redgate, de Haan. Farmer managed to close Minshaw’s lead gap from 14 seconds to around six by the time of the half-time pitstop window. TF Sport’s #17 Aston Martin retired in the hands of Derek Johnston, possibly after a hit up the rear by Rick Parfitt Jnr’s #1 Bentley. Graham Davidson in the Jetstream Aston battled hard with Haigh and de Haan and did make it through to second place, only to go off on the oil just before the safety car was deployed. He made it back to the pits but was a lap down after repairs and out of contention. Optimum’s Adam was wise enough to keep championship thoughts first and foremost and bide his time passing a resolute Ratcliffe, but once he made it through, it was a relatively easy cruise to fourth and the points that brought the third British GT driver’s championship to him and made Flick Haigh the first-ever female GT3 champion. ERC Sport’s Buurman was certainly not cruising in his Mercedes, however, and he went from sixth to third, very confidently taking the scalps of Turner, Adam and Ratcliffe on the way. 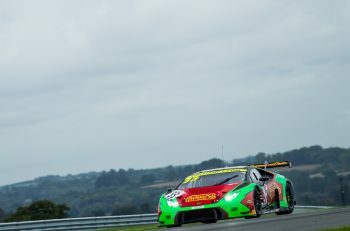 Barwell’s second Lamborghini was sixth, after some closing-lap contretemps for Jonny Cocker with Ratcliffe at Goddards. Those two hit each other two or three times, so Darren Turner breezed past them both on the Wheatcroft Straight and took the #99 Beechdean Aston Martin through to fifth, recovering after an additional pit visit and a spin for Andrew Howard after contact with the RJN Nissan. 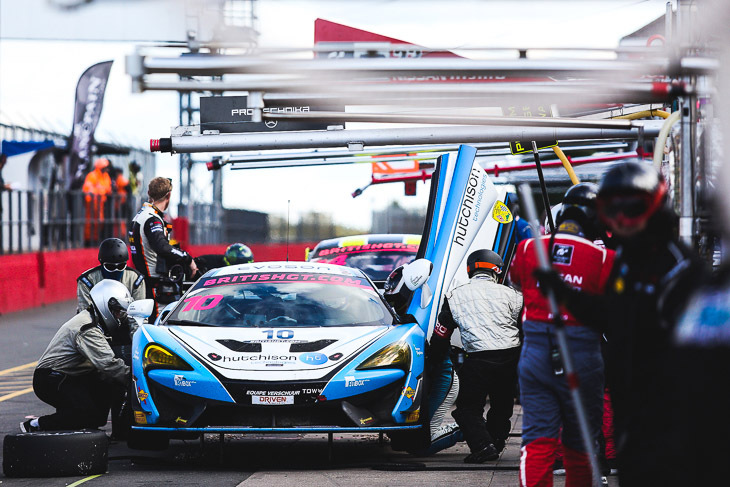 The #10 Equipe Verschuur McLaren (above) crew of Daniel McKay and Finlay Hutchison signed off their 2018 British GT campaign with a win. 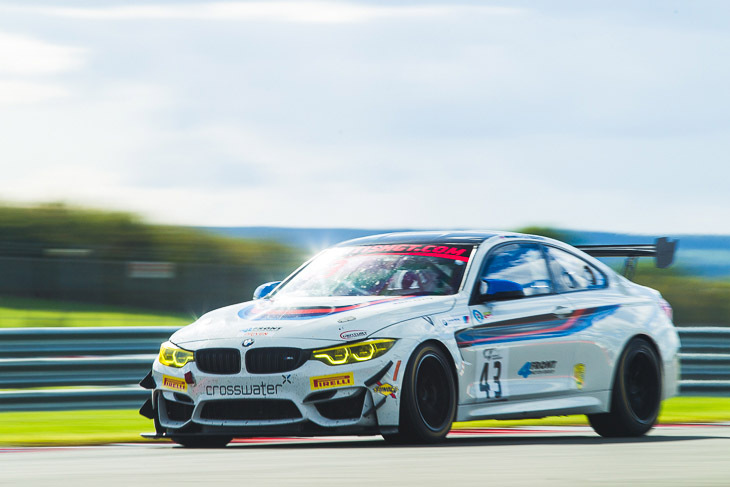 But eighth place in the two-hour Donington Park encounter was enough for Jack Mitchell in the #43 Century BMW to take the overall GT4 driver’s title for the year by just a single point, in solo fashion due to a change of co-driver mid-season. At the start of the race, a lap-one incident at the Craner Curves led to instant retirement for the #72 Balfe McLaren of Adam Balon and Ben Barnicoat, and also ruined the races of the #5 Tolman McLaren (Proctor/Albert), #25 Ciceley Mercedes (Fairbrother/Morgan) and #55 HHC Ginetta (Pointon/Mathiesen) all of whom had to make unscheduled pit stops. McKay started on the front row and held second place in the early stages, before making a move for the lead past the polesitting #42 BMW of Ben Green by lap three. After pulling out a healthy gap, he very nearly came to grief on lap 14 when the 570S hit another car’s oil at Redgate, sending him skating into the gravel. McKay managed to rejoin the track in fourth place, just as the safety car was deployed to allow clean-up of the oil patch he’d hit. Green’s BMW was now once again in the lead, ahead of the #4 Tolman McLaren of Michael O’Brien, #61 Academy Motorsport Aston Martin of Tom Wood, McKay’s McLaren, the #43 Century BMW of Dean MacDonald and the #86 Steller Toyota of Richard Williams. Wood made an unscheduled pitstop shortly after the safety car withdrew, promoting McKay, MacDonald and Williams to third, fourth and fifth respectively. McKay also charged back up the field past O’Brien and retook the lead from Green on lap 30 down the inside through the Melbourne hairpin. So McKay led into the pit window, ahead of Green, O’Brien and MacDonald, although Williams lost fifth place to a recovering Matthiasen in the #55 Ginetta before the stops began. 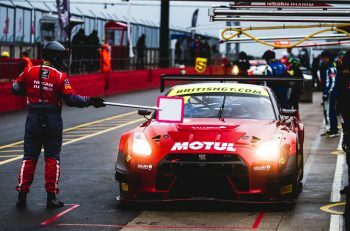 Green and his co-driver Ben Tuck already had to spend 15 seconds extra in their pits due to their podium last time out at Brands Hatch, but life was made even more difficult for them when the car was slapped with 10-second stop-go penalty for a track-limits infringement. That meant the #42 BMW emerged after the pit-stop cycle in ninth place, now with Tuck at the wheel, while Jack Mitchell in the #43 was fourth, behind Finlay Hutchison (who’d taken over the #10 McLaren from McKay), Charlie Fagg (in the #4 McLaren from O’Brien) and Sennan Fielding (in the #86 Toyota). Tuck made gradual progress, moving first into seventh ahead of the #22 Invictus Games Jaguar, then passing the #66 Pro-Am Team Parker Mercedes of Scott Malvern for sixth and finally despatching with Callum Pointon in the #55 Ginetta for fifth, which is where the #42 would finish. Mitchell in the #43 suffered a scare when his car was also hit with a stop-go penalty (in this instance for a pit procedure infringement) but he held on to finish eighth, the points for which were enough to secure the title by a single point from the other Century crew. Besides Tuck, the other big mover in the closing stages was Joe Osborne, who’d emerged from the pit stops fifth in GT4 overall and third in the Pro-Am rankings. He passed both Fielding’s Toyota and Fagg’s McLaren to put the car he shares with David Pattison on the overall GT4 podium, as well as clinching the Pro-Am class victory in the season closer. So the order at the flag was Hutchison from Fagg by 21 seconds, with third-place Osborne a lap behind. Fourth-place Fielding was less than a second aft of Osborne, with Tuck in fifth 7.7 seconds back and sixth-place Pointon a further 13 seconds back. The 2018 GT4 Pro-Am title went the way of Jones and Malvern in the Team Parker Mercedes, who finished the race seventh overall in GT4 and third in the Pro-Am classification, just ahead of overall title winner Mitchell (above).